Fas-associated death domain (FADD, also known as MORT1) is an important apoptosis adapter molecule involved in the Fas-mediated cell death pathway. FADD associates with the intracellular domain of FAS (CD95/APO-1) through their respective C-terminal death domains (DD). The N-terminal region of FADD contains a death effectors domain (DED) which recruits and binds cytosolic proteins such as FLICE/caspase-8. 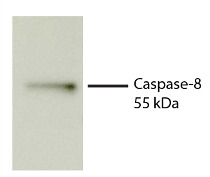 The subsequent activation of FLICE by proteolytic cleavage leads to the activation of the caspase-mediated (ICE-related proteases) apoptotic cascade. Overexpression of FADD induces apoptosis which is inhibited by CrmA, a specific inhibitor of the interleukin-1β-converting enzyme. FADD has also been shown under certain circumstances to promote cell survival and proliferation. Total cell lysates from Jurkat cells were resolved by electrophoresis, transferred to PVDF membrane, and probed with Mouse Anti-Human FADD-UNLB (SB Cat. No. 10941-01). 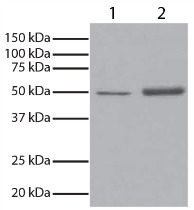 Proteins were visualized using Goat Anti-Mouse IgG, Human ads-HRP (SB Cat. No. 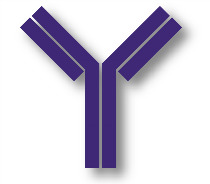 1030-05) secondary antibody and chemiluminescent detection.